Mummy Talk: Cosatto Giggle 2 Review. Now I have had my pushchair for a full year, I feel it is a good time to review it. 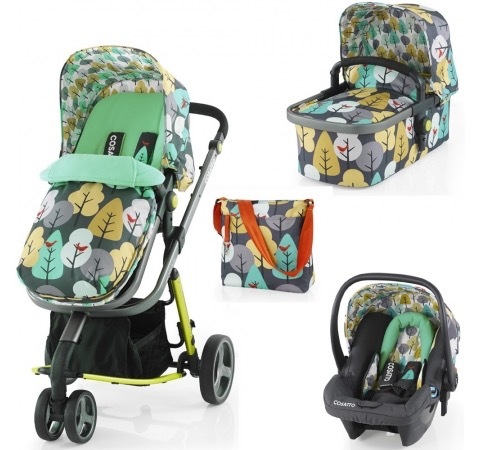 The pushchair I have got is the Cosatto Giggle 2 Travel System in the style Firebird. Origionally when I first purchased this pushchair I had it in the colour Oaker, unfortunately I broke the brake with in the first 10 weeks of using it and the colour had since been discontinued. When shopping for pushchairs I didn’t want to go for something big and bulky as I was limited with space in my boot, and I also wanted something of good value for money. I knew I wanted a travel system but I didn’t have a clue what I was looking for. When I came across the Cosatto Giggle 2 I was shocked by how much you get for your money. Included in the price of £470 you get, chassey, carry cot, pushchair, changing bag with messy bag, rain covers and cosy toes. Comparing this to other pushchairs I noticed that these additional items often came at a further expense. At the time I purchased my travel system, the hold car seat came at a further cost of £125. Now mothercare are doing an offer where the car seat comes for free which is a fantastic offer. Even though I have had problems with the brake on my pushchair I have researched and found that this is not a common problem in Cosatto pushchairs and I have just been unfortunate. I absolutely love my pushchair and I’m so glad I opted for this one. Being a travel system it is so easy to assemble and collapse. The wheels are detachable making it that bit smaller to store away. The carrycot, chair and car seat all attatch to the chassey with two simple buttons making it super easy to transport your sleeping baby from car to pushchair. All in all I would highly recommend this beautiful pushchair and we will definitely be keeping hold of ours for future babies.